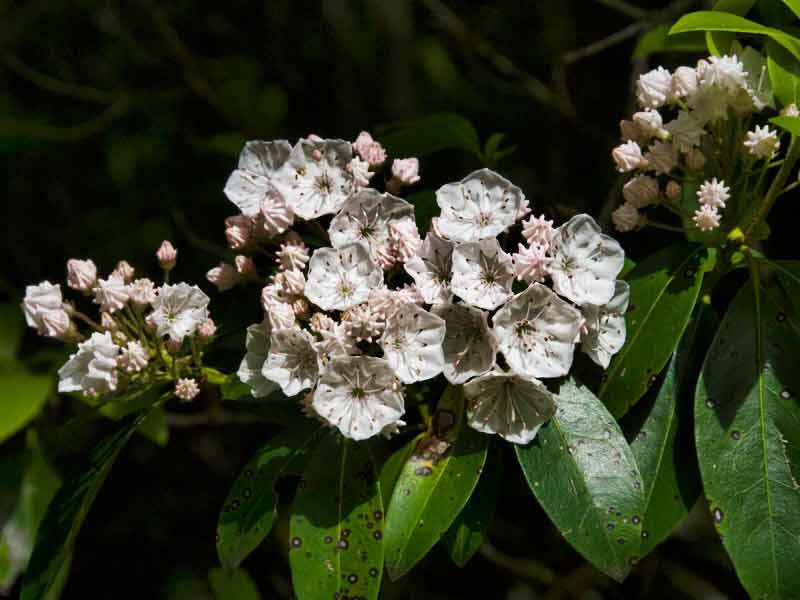 The intricate design of the Mountain Laurel (Kalmia latifolia) was a marvel for me in 1970 when I was a student on a field trip to the Smokies from Auburn University. Systematic Botany was a wake-up call to a budding zoologist who should not think there was little to learn from fixed, do-nothing greenery. I declared a botany minor after that field trip. Laurel’s ten spring-tethered anthers (the pollen package) are arranged radially around the receptive stigma–the female part–in the very center of the flower. A visiting insect would typically land on the disk and walk around the center in search of high-calorie nectar. And zap! the tension in the tethering “filaments” would shoot pollen onto the bee who would fly off with pollen from Plant A to deposit it on the female parts of flowers on Plant B. But wait. Is this REALLY the strategy and method Kalmia uses to maintain genetic vigor? High-speed filming has revealed some answers. Another similar method is used by a dogwood called Bunchberry–but the anthers additionally are able to swivel at the end of the filaments–creating more of a trebuchet force than a simple catapult like Kalmia. Watch this short video of explosive Bunchberry pollen at 10k frames per second.